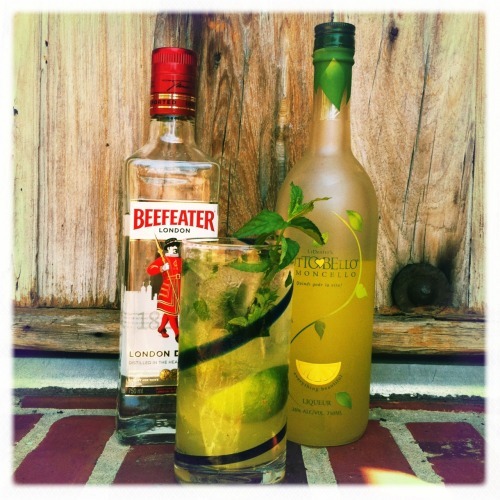 Here is a great twist on a vintage cocktail, the Tom Collins. The Tom Collins is made from from gin, lemon juice, sugar, and carbonated water… essentially a gin and sparkling lemonade. There is kind of a funny story about this concoction that dates back to around 1874 in New York and the surrounding states where locals would jokingly start bar conversations with visitors by saying, “Have you seen Tom Collins?” (knowing the response would be that they did not know a Tom Collins). The local would then continue the prank by explaining that a Tom Collins was talking about them and that they were “just around the corner”, in another (local) bar, or somewhere else nearby. The prank was all in fun to see how much of a reaction they could get out of the visitor. The prank became so popular it was even featured in several newspapers that year. For this variation, we give it more of an island twist by substituting the lemon juice with lime and adding some mint (much like a mojito). To honor the traditional lemon flavor, we add some limoncello, an Italian lemon liqueur often produced in the islands of Procida, Ischia and Capri. Limoncello is common to have along with dessert, but is an increasingly popular ingredient in cocktails. For this drink it is perfect as it not only adds the lemon flavor needed to classify this a Collins drink, it also has enough sweetness to it that we don’t need to add sugar or simple syrup… plus being a liqueur helps give extra kick. Directions In a cocktail shaker, add the lime juice and mint sprigs. Use a muddler to mash the mint. Next, combine the limoncello, gin and some ice. Shake vigorously and then pour into a tall glass. Add the club soda, top with ice and garnish with mint and lime slices. Tiki Tip: For a more “tikified” version, substitute Havana Club Light rum for the gin.